Enter the Sunwing Vacation like a Princess Contest, in it, you could Win a trip to the Grand Sunset Princess All Suites Resort & Spa in Mexico. To enter you have to visit the official contest web site and completely fill out the online entry form with all the requested information with your name, last name, email address, province or territory, preferred gateway and language, agree to the terms & conditions and submit it. Contest ends at 11:59 pm EST on April 12, 2019. Winner will be selected randomly from all valid entries. 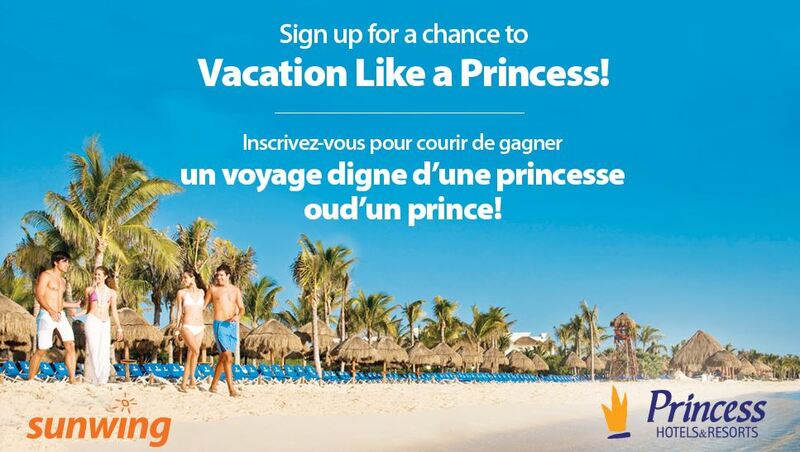 The Sunwing Vacation like a Princess Contest commences at 8 a.m. EST on Monday, April 1st and concludes at 11:59 p.m. EST on Friday, April 12th. The draw will take place on April 19, 2019. Winner will be contacted by phone or email.